History of Ranthambore Fort revolves around Sawai Madhopur. Sawai Madhopur town is identified by Ranthambore National Park and Ranthambore Fort which is surrounded by Vindhyas and Aravallis, amidst vast and arid denuded tracts of Rajasthan. Ranthambhore name came from the two hills, Rann and Thambor which are in close proximately of each other. Fort lies on an isolated the Thambhore hill and 481 metres (1578 ft.) above sea level and Rann is adjoining the hill of Thambhore which covers some breathtaking views and the entire top of a hill at the heart of the Park. It has become part of the UNESCO’s World heritage Site under hill forest series of Rajasthan. The Ranthambhore fort is believed to have been built during the 8th century by the Chauhans ruler, though the exact ruler during whose reign the fort was initiated is difficult to name. Ranthambhore came into existence after Prithvi Raj Chouhan who was last Hindu king of Delhi,Prithvi Raj Chouhan's descendents came to Ranthambhore and made this place their capital, but the actual fame of Ranthambore came when most known ruler of this period Raja Hammir Dev was crowned in 1283 A.D.The fort was attacked by a number of big powers at different point of time in history.Prominent among these were Qutub-ud-din (1209), Allaudin Khilji (1301), Feroz Tughlaq (1325) and Bahadur Shah of Gujarat (1530).Finally, the fort was captured by the Mughals who earlier used it as a staying place and then later as a prison fortress.In the 19th century, the fort was given back to the Maharaja of Jaipur and it remained with them till the time India gained independence in the year 1947. The Ranthambore Fort spreads over an area of 7 kilometers in circumference and includes an area of nearly 4 square kilometers. The fort had many buildings inside of which only a few have survived the ravages of wars and time. 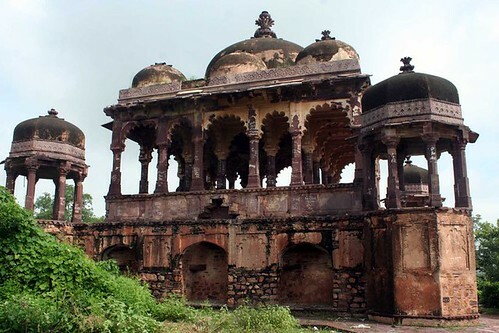 Among the remaining ruins, the two pavilions, Badal Mahal , Dullah Mahal, 32 Pillared Chhatri and Hammirs court give an idea of the old grandeur.The Fort also has many cenotaphs, mosques,temples, barracks, step-well and gates. All around the fort you can see many old ruins with remnant of walls are mute testimony of past.For water supply there are two rain fed reservoirs in the fort. The fort is surrounded by massive stonewalls which are strengthened by towers and bastions. The entire stone for masonry work has been mined from fort area itself and the mines were later turned into ponds for water storage. The Ganesha Temple is major attraction of the fort, Thousands of people come here from every corner of the country,and seek blessings from the Lord for happiness and prosperity. A good day to visit the fort is Wednesday, the day of the Lord Ganesh, when a lot of local people visit the Ganesh temple.One interesting aspect is the mail that is sent to Lord Ganesha consisting mainly of wedding invitations. These letters are delivered daily by the local postman. The Fort is good place for bird watching. There are large numbers of birds, Langurs, the odd small cat and elusive Fishing cat use the area.